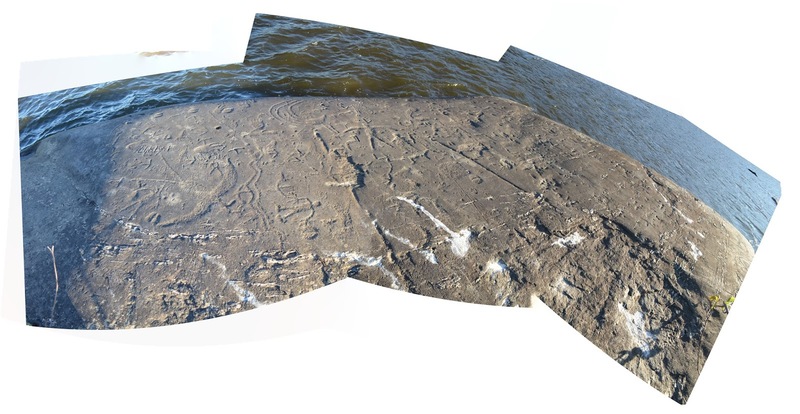 A previous blog identified the Lower Susquehanna River as containing one of the largest concentrations of prehistoric petroglyphs, or rock carvings, in the Northeast. Out of the multitude of these sites which were once accessible in the area, only a small handful remain intact. Although several publications discuss the images found on these petroglyphs, fewer accounts convey the beauty and natural wonder of their surroundings. The golden hour on the Susquehanna. In the background, you can see people standing on Little Indian Rock, the most well-known of the petroglyph sites in the Lower Susquehanna. Despite the looming presence of Safe Harbor Dam and the alarms which signal dam releases at frequent intervals, the water just down river remains relatively calm. It is important to remember that the river landscape of today is drastically different from what existed before the construction of several hydroelectric dams along the river. This section of the Susquehanna was once described by Donald Cadzow as having numerous rapids only navigable by canoe, quite a difference from the glassy waters that are found here today. 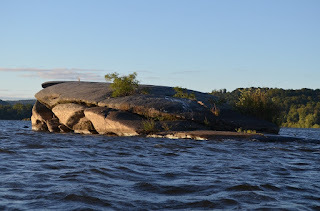 From the confluence of the Conestoga and Susquehanna Rivers, a paddler can make their way past numerous rocky outcrops (some containing petroglyphs) and islands blanketed with thick vegetation. It’s not difficult to imagine why this was a place of significance to the prehistoric people who visited and lived here for thousands of years. Wildlife, resources, and natural beauty abound. The petroglyph sites in this area of the Susquehanna were first documented in 1863 by professor T. C. Porter of the Linnaean Society of Lancaster County. Since then there has been periodic interest in the sites, which for many years were thought to have been lost behind Safe Harbor Dam. Unlike the abstract glyphs documented on Walnut Island, now submerged behind Safe Harbor Dam, those found on Little Indian Rock are more naturalistic and represent identifiable animals such as birds, humans, snakes, and quadrupeds. A composite photograph showing numerous glyphs on the northern face of Little Indian Rock at sunrise. At first glance, it is apparent that Little Indian Rock has numerous carvings on its surface, but it isn’t until closely examining the site under optimal light that the sheer number of glyphs on this rock become apparent. No doubt that an immense amount of time was spent creating them. Although no definitive age has been established for the creation of these sites, they are thought to have been made no more recently than around 500 years ago but are possibly much older. It is agreed upon that they are of Algonkian origin as they bear similarities to other petroglyph sites and motifs of the expansive culture group that once inhabited this area. Big Indian Rock at sunrise. The other prominent petroglyph site in the Lower Susquehanna, Big Indian Rock, exists just downstream of Little Indian Rock. This location contains numerous, but less distinct glyphs and more widely spaced images than Little Indian Rock. Many of the glyphs on Big Indian Rock are nearly impossible to see without ideal lighting. This site is unique, not only for the motifs which adorn it, but also for its prominence in the river. 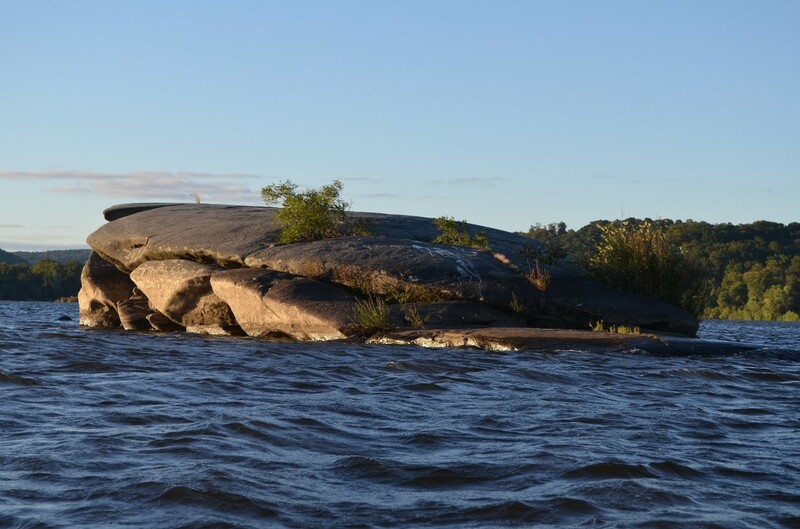 It is the tallest and largest of the rocky outcrops in this section of the Susquehanna. From atop Big Indian Rock, individuals experience a breathtaking vista that stretches for miles. The modification of these petroglyph sites extends beyond their most prominent petroglyph panels. Understandably, maps have failed to capture the full scope of the ways in which humans have modified these sites. 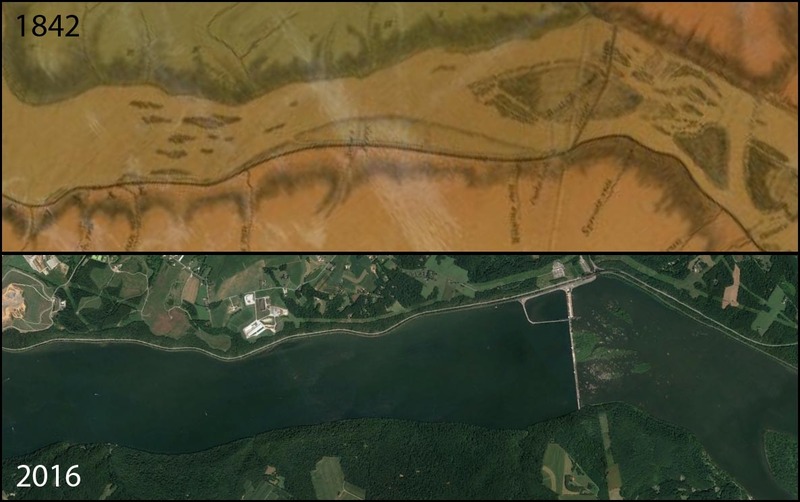 The preservation of these sites has largely been attributed to their remote location in the three-quarters of a mile-wide Susquehanna River. As with any significant historic or prehistoric site, vandalism is always a concern. When visiting petroglyph sites care should be taken to avoid impact. With proper respect and conservation, these awe-inspiring sites will exist long into the future. - Photograph and sketch the images but avoid taking rubbings which can hasten the deterioration of the petroglyphs. The best time of day for viewing petroglyphs is early morning or evening, when the Sun is low on the horizon. - Do not introduce any foreign substance to the rock surface such as paint or chalk, these actions can damage the image. - Do not repeck, recarve or deface the images in any way, these actions destroy the original image. Many rock art sites have been destroyed by the addition of historic graffiti. Thank you for visiting our blog, we encourage everyone to learn about the archaeological resources in your community. We ask you to join us in ensuring that our archaeological heritage is preserved by supporting public programs and preservation laws so that we can protect the past for future generations. Cadzow, Donald A. Petroglyphs Rock Carvings in the Susquehanna River Near Safe Harbor. Pennsylvania... Vol. 3. No. 1. Pennsylvania Historical Commission, 1934. Diaz-Granados, Carol, and James R. Duncan, eds. The rock-art of eastern North America: Capturing Images and Insight. Vol. 45879. University of Alabama Press, 2004. Lenik, Edward J. Making pictures in stone: American Indian rock art of the Northeast. University of Alabama Press, 2009. Vastokas, Joan M., and Romas K. Vastokas. 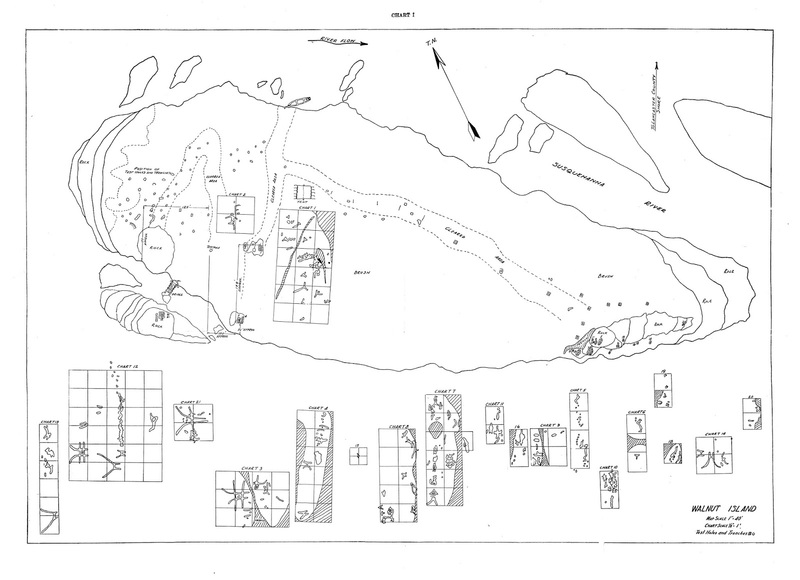 Sacred art of the Algonkians: A study of the Peterborough Petroglyphs. Mansard Press, 1973. The State Museum of Pennsylvania, Section of Archaeology staff are the stewards of the archaeological record for the state of Pennsylvania. As such, the staff undertake numerous tasks to preserve the artifacts and records from sites across the state that have been donated to the museum. Many of the duties performed in the Section of Archaeology have been discussed in detail throughout previous posts of this blog, but one major responsibility that each of us has is to preserve site information, catalogs and artifacts for use in future research. Researchers use the data collected from us to develop conclusions on theories or ideas and present their findings at conferences and through publications, which can then further our understanding of Pennsylvania’s rich history. Over the past few weeks, staff members and archaeologists from across the state have been attending annual conferences and meetings. Presentations at these meetings discuss any number of topics including new artifact or site studies, more accurate or efficient methodologies and tests, and new insights on previously studied sites or collections. 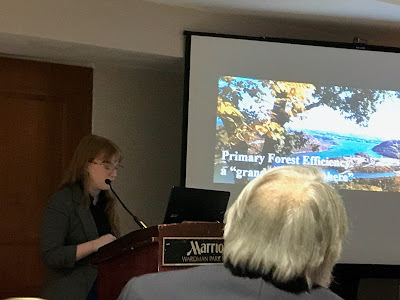 As was noted in our previous blog, several staff members recently attended this year’s Society for Pennsylvania Archaeology (SPA) annual meeting. Once again, this conference was a success with topics covering prehistoric population movement, numerous site analyses, ceramic and bead analyses and much more. With the SPA annual meeting now over, our sights are set on another conference, taking place right now. The Society for American Archaeology (SAA) annual meeting began on Wednesday April 11, 2018 and is running through Sunday April 15 in Washington D.C. The SAA meeting brings together archaeologists from across the country to continue sharing knowledge and developing a more in-depth understanding of the archaeological record across the continent. After a quick glance through the extensive conference program, staff in the archaeology lab recognized a few names. As is mentioned above, one of the principal goals of the Section for preserving artifacts and documentation is to open our doors to researchers who would like to use the collections to further our understanding of the archaeological record through various forms of analysis. Two of our more recent researchers, Lucy Harrington and Amy Fox, who spent long hours performing such research will be presenting at the SAA meeting. These young women are finalizing their projects and will be sharing the results with the archaeological community. Researchers like Lucy and Amy are some of the most common type of researchers we have at the Section of Archaeology, college students working on advanced degrees. Lucy and Amy both analyzed different types of projectile points in order to determine various aspects of their use. Both young women built upon older methods, using different types of measurements and/or three-dimensional imaging to analyze the projectile point attributes. 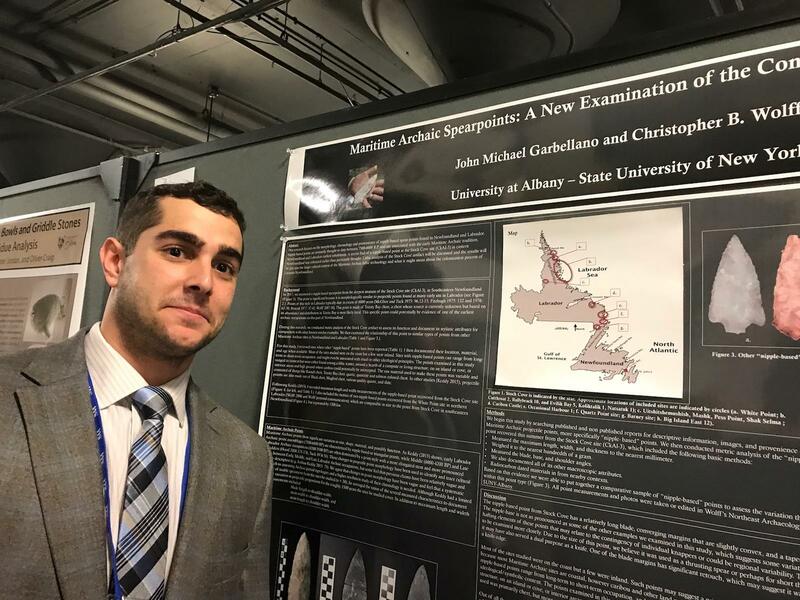 Other recent student researchers examined animal bone assemblages from different archaeological sites to understand the use of different animal species in a culture and how domestic animals were transported across the landscape. We have benefitted from an array of research subjects from very specific topics, looking at one attribute of one type of artifact to more broad scope topics, such as comparing assemblages between sites. Other researchers frequently using the collections at the State Museum are professionals, who prepare papers, do background research for other projects or continue long-term projects. One such example is, Dr. Bernard Means a Virginia Commonwealth University professor who has a close working relationship with the Section of Archaeology. 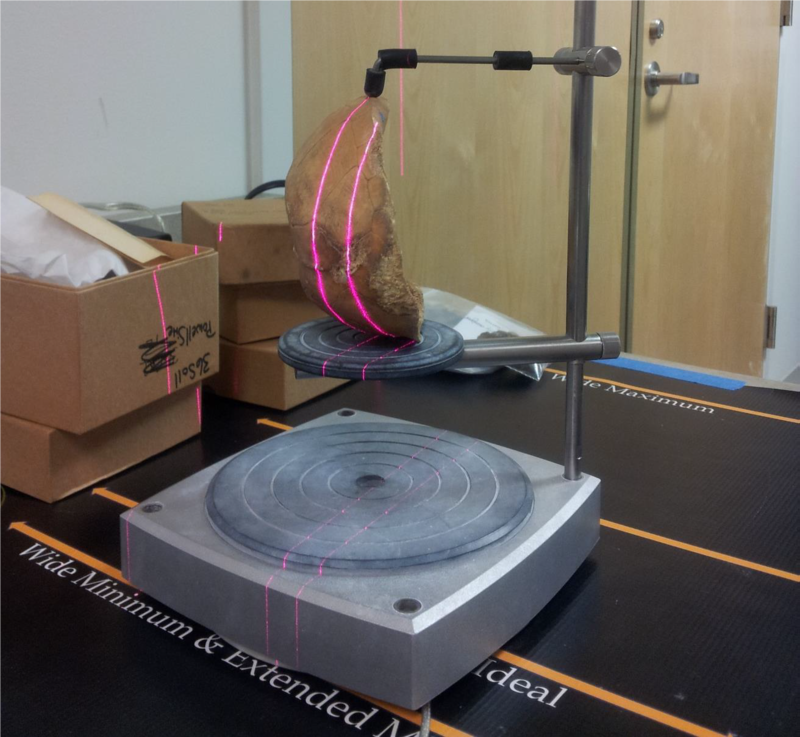 He has been working with us to 3-D scan various types of artifacts for his Virtual Curation Laboratory. With the data he has collected from our collections Dr. Means has been able to provide us with 3-D printed examples of some of these artifacts, which we use for outreach programs. Dr. Means will also be seen sharing information on his work at the SAA meeting this week. Finally, research is also performed in house. The Section of Archaeology staff are often found doing further research on various subjects for presentations and other public outreach programs. This and last year several staff members presented on various projects at the annual SPA meeting and two staff members are participating in the currently ongoing SAA meeting. Protecting and preserving Pennsylvania’s archaeological collections is what the staff of the State Museum of Pennsylvania, Section of Archaeology do on a daily basis, but in order to increase the knowledge about Pennsylvania’s past we encourage researchers to take an interest, perform research, develop ideas and share them with the world. It is through research and sharing that we learn and develop a better understanding of the archaeological record. By doing this we can truly Save the Past for the Future. If you are interested in researching a specific type of artifact or site we encourage anyone with a scholarly research project to submit a research request for access to the collections. For additional information or to make a request, please contact Janet Johnson at janjohnson@pa.gov, or Kurt Carr at kcarr@pa.gov.